Pinky, now Lili, came into the shelter with some serious skin problems, but we cleared them up over the spring and she now has a wonderful life with her new family. 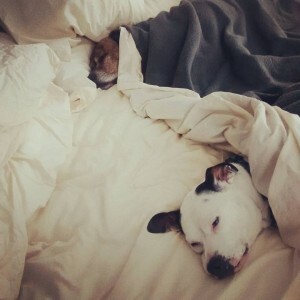 According to her adopters, she really looks up to their other dog, Syd, and spends lots of time with him. 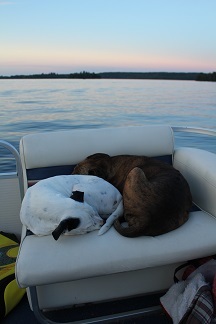 Over the summer, Lili even went on vacation to a lake in northern Minnesota with lots of people and eight other dogs. We hear, “She’s such a love at home; her consistent sleeping spot is between us in the bed. Overall, she’s just such an easy and affectionate girl.” Here she is with Syd, after a day on the lake and a tough day at home.